This is probably the best Invisible Deck in the World. You cannot see or feel any rough&smooth treatment on the cards. Yet they stick together and separate just like they should. A spectator names a card from an Invisible (Imaginary) Deck and after a battery of funny gags and one liners he has turned the card face down in his face up non-existing deck. You bring out your deck and spread them out, one and only one card is turned face down: of course it is the same card as the spectator named. 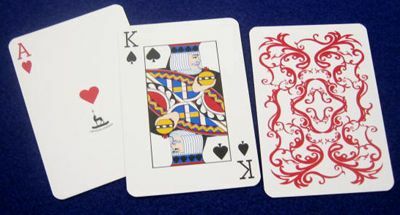 This is an Invisible Deck in Anglo Poker Edition09 design and size (white back with red design). Complete with instructions. ESP Anglo Giant Deck with blue back. 25 plain ESP symbol cards. Anglo Rainbow Deck - the same design on all backs, but in 52 different colours. When you spread the cards in new deck order it looks like a rainbow! Anglo Poker Edition09 Gaff Deck - 55 gaffed cards, gag cards and utility fake cards. ESP Deck with white on black back design. 25 ordinary ESP cards with 5 of each: circle, cross, wave lines, square and star + 25 marked ESP Cards + 4 double facers. Signature Transfer. Sixten Bemes's wonderful effect where your signature appears on the face of the spectators card and his/her signature appears on your card.